This tutorial introduces you to IBM DataStage and how ETL jobs are developed, tested, and managed. Use integration, quality and governance to create trusted data for analytics and machine learning in your data lake. Avoid data swamps by embedding data integration, data quality, and availability into your data lake environment. Extract, transform, and load data between multiple sources and targets. Watch how QuadReal’s decision-makers get timely, accurate insight into data scattered across many disparate source systems. 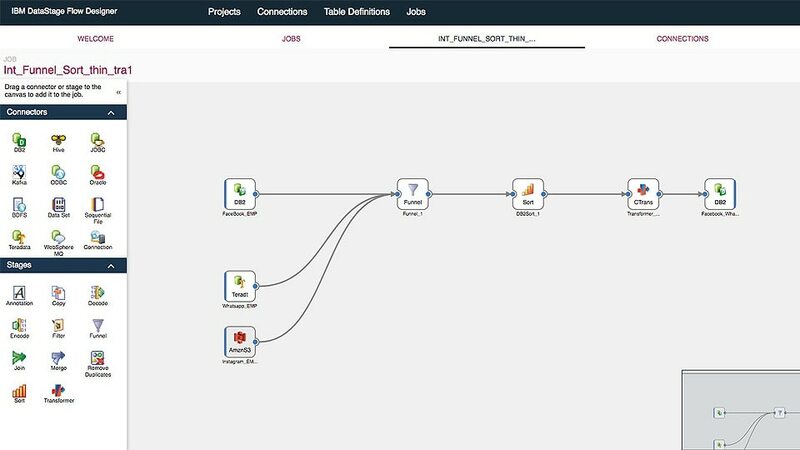 Show the basic concepts of building and running ETL jobs in DataStage and see how users can track the flow of data lineage. Use DataStage to lift and transform data while running inside Hadoop Clusters to reduce license and hardware requirements. Integrate IBM DataStage with IBM Data Replication to update Cloud-based data repositories and data lakes in real-time. Building out your data lake? Learn about enterprise data warehouse (EDW) offloading in this informative demo. Empowers business users with an enterprise data hub for real-time analytics. Dazzling customers with compelling, relevant offers powered by IBM Analytics. Transforms the responsiveness of public services with big data analytics of citizens’ feedback. Laying the foundation for rapid asset growth with deep insights into a global real-estate portfolio. Continuously improving the quality of care with powerful, flexible analytics. Harnessing IBM Analytics solutions to monitor and predict students’ performance and help them stay on the path to success. Gains rapid insight into client care, billing, asset resource management and more. JLG chose the IBM information server platform in order to fit their needs for the future. Learn how information that drives business and strategic initiatives becomes trusted, consistent and governed. In this tutorial, learn about the tasks involved with creating parallel jobs.